﻿ In Memory | Lennox. 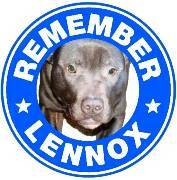 This week we remember precious Lennox on the second anniversary of his tragic death on Friday 11th July 2014. The suffering of Lennox, held under BSL as a prisoner of the law simply for the way he looked, sent shockwaves around the world and caused great distress. In honour of Lennox, the Global Anti BSL Protests began and they continue in many countries, this year the protests take place on 19th July. Lennox remains in the hearts of all those around the world who will never forget his plight and believe no dog should be killed for looking a certain way. Our thoughts are with Lennox and his family at this sad time of remembrance and we feel sorrow that Lennox could not be saved though his death is not in vain and in Lennox's name we continue to campaign against an unfair and cruel law that has taken the lives of countless four legged family members and continues to break hearts all over the world. Lennox Remembered on the 2nd Anniversary of his death - 11th July 2014 - the Lennox Campaign. 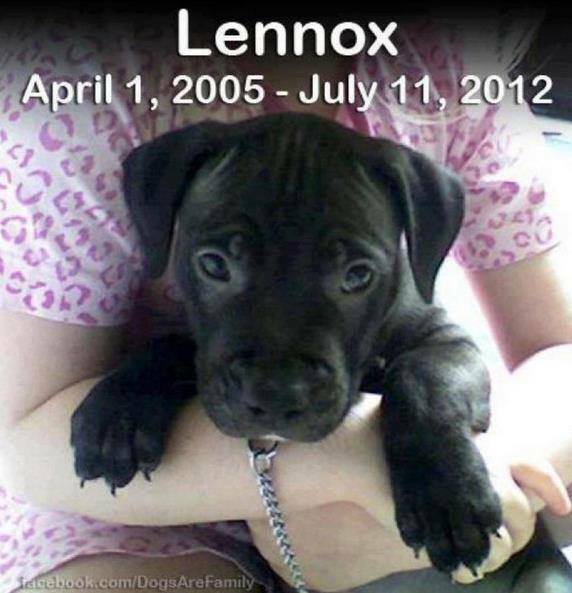 Lennox died on 11th July 2012. He taught thousands about the heartbreak of BSL. Each year we will create a new "I am Lennox" album. We hope each year we will have more pictures than the year before. So far there are two thousand, three hundred and forty six I AM LENNOX photos from around the world and rising. To add your picture simply post to our Facebook wall. Each picture must have the words "I am Lennox" on. By posting the pictures you agree to us adding them to this years album and using them in future videos. When You Killed Lennox - A song written as a gift for the Lennox Campaign on the second anniversary of Lennox's death. If you would like to download this song in Lennox's memory, the Lennox Campaign have requested that any download proceeds go to DDA Watch to help other dogs affected by BSL. You can receive an mp3 copy of the song by donating £1 to DDA Watch via paypal address; ddawatch@gmail.com and when your donation is received the song will be emailed to you. Sleep at night, how do you do it? A new video and song in memory of Lennox - a collection of pictures created by Lennox supporters worldwide. As part of our remembrance week for Lennox, please light a candle in Lennox's name at 7pm on the 11th July and we will hold a minutes silence at that time, united together all around the world as we remember the tragic loss of Lennox and all those precious and much loved dogs who have also lost their lives to cruel and unfair Breed Specific Legislation. 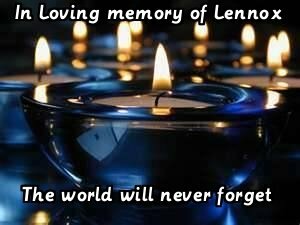 Please send pictures of your remembrance candles and we will include them in an album for Lennox as we show the world that we will not tolerate inherently flawed BSL, a law that kills dogs for looking a certain way.